Custom Dollhouses is our speciality, we can take a plain dollhouse kit and turn it into something special, or a larger kit into a “Mansion”. We can add stone or brick foundations, slate walks, tile or marble foyer, electrical plugs and lights, hand cut stone chimney, porches, room additions, and more. Here are some larger “Custom Dollhouses”. how do I see inside these houses? Email be at dollhousemansions@gmail.com which dollhouses you like and I will give you prices. You could also call my cell 203 768-3816. Love pink one you are working on or gray one or yellow one with man in purple shirt. How can I order? Hello, I’m a dollhouse fan from Thailand. I don’t crate and ship dollhouses, if you find a shipper that will ship abroad, then you will deal with them direct. I can build you a dollhouse of your choice and your shipper can pick it up from me. I did take a look at the Manor House and I don’t recall any kits like that, I will look around for you. I also have friends in Europe that I will ask. I will be in touch. hello – I would like to know more about buying and furnishing an assembled doll house but I have no idea where to start learning about this hobby/craft. I am inspired by a beautiful wood dollhouse a friend owns – her father made it for her nearly 50 years ago and she decorates it each season. I’m enthralled by it – there is always something new to see inside the rooms. Any direction you could provide would be most appreciated. I love the Lawbre houses but they are a bit too expensive – are there other makers who do quality houses? Thank you so much! Linda in Cincinnati Ohio. 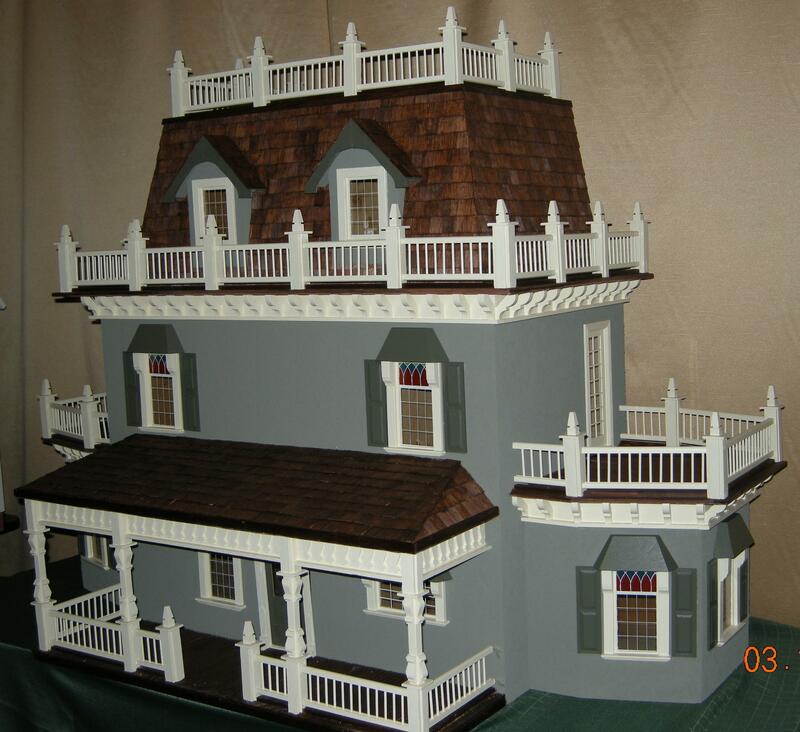 Hi Linda, thank you for checking out my web site, I have been building custom dollhouses and kits for 25 years, I have over 250 different kits that I can build in any size, style and price. Please call my cell phone 203 768-3816 to discuss some options for you and your dollhouse project. 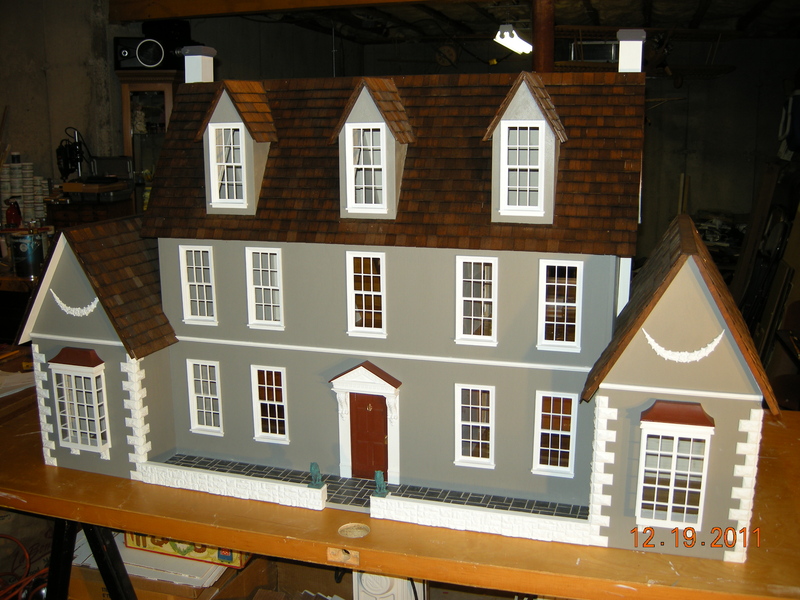 If we send you a picture of our house are you able to create a custom dollhouse to match the exterior? Yes I can build a dollhouse of your home, but would like to have building plans of the house if possible. My email address is dollhousemansions@gmail.com and my cell is 203 768-3816. Thanks for checking out my web site. I think your work is simply amazing. I’m dollhouse shopping right now & I was looking for ones that were large and folded open and closed on the backside. Please help me. I hope that I can help you out. Building custom quality dollhouses for over 26 years and still love the work. I live in a house my parents built on a farm before I was born. This house was soley built from beginning to end by them minus a little electric work and some gas work. So this house is extremely important to me considering my dad died 10 years ago, when I was 7 years old. But in the next year or so we plan to move on to new things in a new place. But id like to keep part of the house with me. Can you all build one exactly right. With the exact room measurements? Would like to get aomething.like this for mom. What is the price range? Thank you for checking out my web site. I build over 250 different dollhouses in any size, style and price for customers all over the USA for the last 27 years. Best to call my cell 203 768-3816 to discuss, then after doing some searching of what you like, I will email pictures and prices. Would love to see what you have in something farm house type, three bedrooms, bath, kitchen large living room area but no formal dining room area. Would like for the kitchen to be good size to be able to fit a table with four chairs and a baby’s high chair with all the normal kitchen appliances. Would love to have flower boxes on the front porch or window boxes. Would I be able to pick out all the colors to use inside too? What about wall paper and flooring? Would you be able to give me a ball park figure on what it will cost? I’m very interested in having one made and soon too. Thank you for your time and interest. Thanks for checking out my web site. I think that I can help you out, but I have some questions to ask you. Would you please call my cell phone 203 768-3816, or send me your cell phone number to dollhousemansions@gmail.com. Can you build one that looks like our actual house? 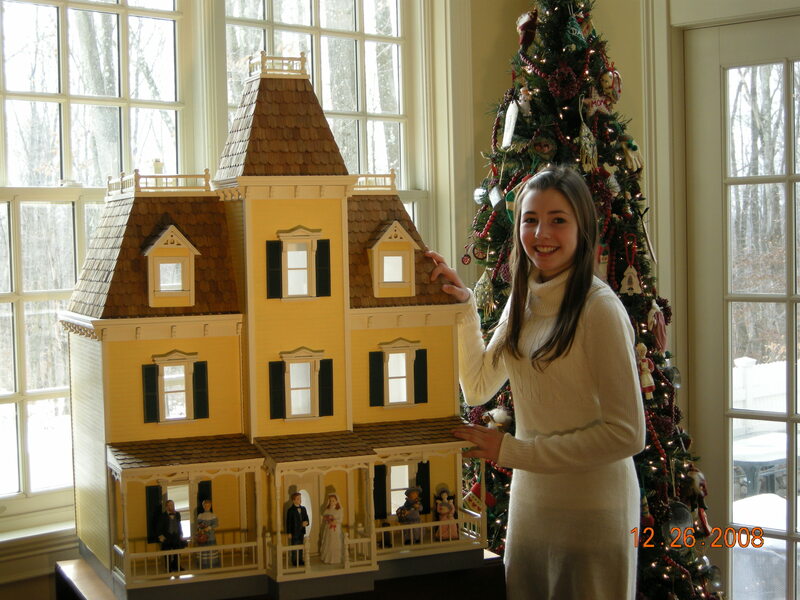 Hi, yes I can build a replica of your house, not many Master Dollhouse Builder like me, left in the country. I have been building quality custom dollhouses for 27 years and still love the detail and the highest of standards in miniature building. Please call my cell to discuss 203 768-3816. Hi there! I just have to ask if you can build dollhouses scaled for 18 inch dolls! I have been on a search to buy my daughter a custom built 18′ scale dollhouse, but so far have has 0 success. Hoping to figure out something, thanks! I never had a request to make a dollhouse in that scale for 18″ dolls. Try Amazon, there are a few kits for that size doll. You can give me a call to discuss on my cell 203 768-3816. Hi there! Wondering if you are able to make a dollhouse scaled to size for dolls like american girl. Do you have previous work made for 18 inch dolls? I’d love to see it. Hello– I am looking for someone who can build a dollhouse version of my house. Could you make one? Yes I could build a replica of your house, depending on looking over pictures and plans and how much detail is involved. 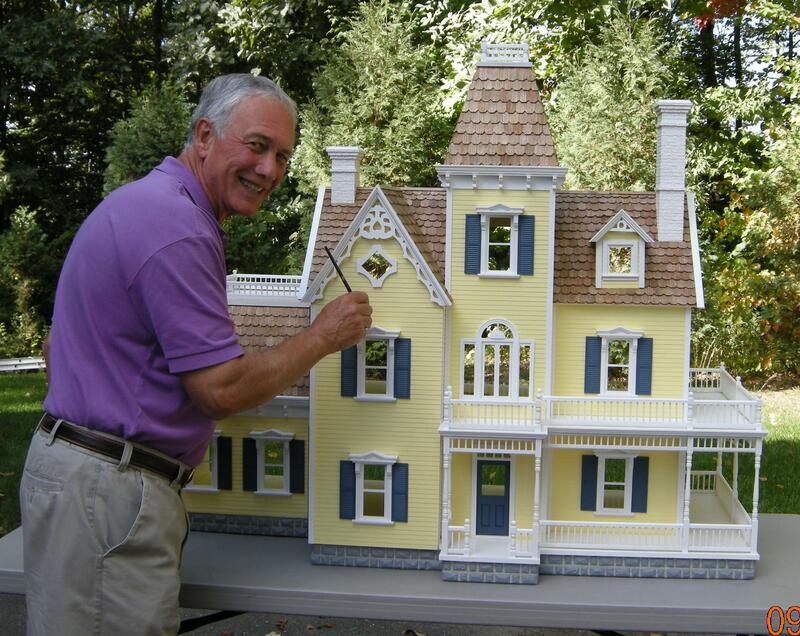 I have been building quality custom dollhouses for 28 years for customers all over the United States. Please send pictures of all four sides of your house to my email address ( dollhousemansions@gmail.com ) and a phone number that I can reach you to discuss your project. There are not many dollhouse builders that do this type of work, so I get a lot of requests. Hello, do you do anything for Barbie? One of the kit companies that I’m a dealer for had three kits for Barbie size dolls, I would have to check to see if they are still available. Send me an email at dollhousemansions@gmail.com with your telephone number and I will get back to you. Hi. My daughter really loves the idea. Do you make replica versions of real houses? If so, send me an email at SamanthaParker@gmail.com. I will do my best to reply. I work at my own private Etsy shop making scarves, hats and mittens for my friends. If you want one, email me. Great looking little mansions.. Your work is second to non… Amazing.. If you ever need electrical information feel free to contact me…. We met at Christmas party..
You have beautiful doll houses. I was wondering how to see the inside of them. Also what are your prices for a custom one? Do they come with furniture and things for the inside or is it only the house? Thank you so much! I would like to send you pictures of a chalet to see if it is possible toske a replica of it? It burned down in the Tennessee fire recently and it would mean a lot to my family. We are looking for a custom doll house for our granddaughter, but need a doll house that would fit Barbie dolls. Would you be able to send me pictures of doll houses that would show inside of house? I am an oil painter interested in purchasing one of your custom-built dollhouses to be used in a special project. To give a background, I have been a volunteer for approximately 15 years at a special art show held in an authentic colonial grist mill in a tiny village called Millwood (a hidden rural gem in Virginia). The entire show is run by volunteers and everything that the art show does is to help in a greater cause: we use the funds to promote unknown and beginning artists, protect rural lands, and preserve historic architecture. We even restored the mill to working order (the very mill we hold the show in) so now we can grind and sell organic grain using colonial methods. The Mill has become the pulsating heart of the rural community, and the surrounding artists, its spirit. The Mill, and its art show, have become beloved to the community. I would like to re-create the artshow in miniature form. I can paint and do the detail work of the Mill, and plan on reproducing miniature paintings of our best artists inside; but would need one of your houses as my structure. The architectural structure is very box-like. I don’t even need the mill wheel since that is in the basement and the show is held on the main and upper levels. I would like the dollhouse to be able to swing open like a double-door cabinet, but other than that, it would just be bare-bones. Essentially, you would be my canvas. How much would something like this cost for you to do? If the price is too inhibiting for me (you have to remember I make no money as a painter), then do you write any books on how to build a dollhouse that I could purchase? If not, is there a book(s) you recommend? I know you will need more photos, but I won’t be able to get any until April when I am scheduled to go down there and start setting up the show again. In the mean time, here are some links that may provide some preliminary photos. I have a beautiful house like the ones in your photos, that needs some repair. I would like to hand it down to my daughter as a gift. Do you do doll house repairs and if not, can you recommend a place? As well as to buy new accessories for the inside?? Yes I do repairs and restore dollhouses. I have been building quality custom dollhouses and repairing dollhouses for 28 years, for customers all over the USA. Can you send me pictures of the dollhouse showing me what has to be done and include a list of all the work you want done? Please also send me a cell phone number so that we can discuss the work. Where are you located? Can you get the dollhouse to my workshop in Woodbury, CT? Send info to dollhousemansions@gmail.com my cell is 203 768-3816. Hello, I’d love to get my daughters a dollhouse for Christmas. Can you email prices? My email is melindavalasek28@gmail.com. Also I’m in North Carolina. Can you ship Fedex or UPS? Thank you for checking out my web site and my dollhouse work. I’m a retired Industrial Arts teacher and Master Dollhouse builder for 28 years and build for customers all over the USA and also to other parts of the world. I can build almost 200 different dollhouse kits in any size, style and price range. 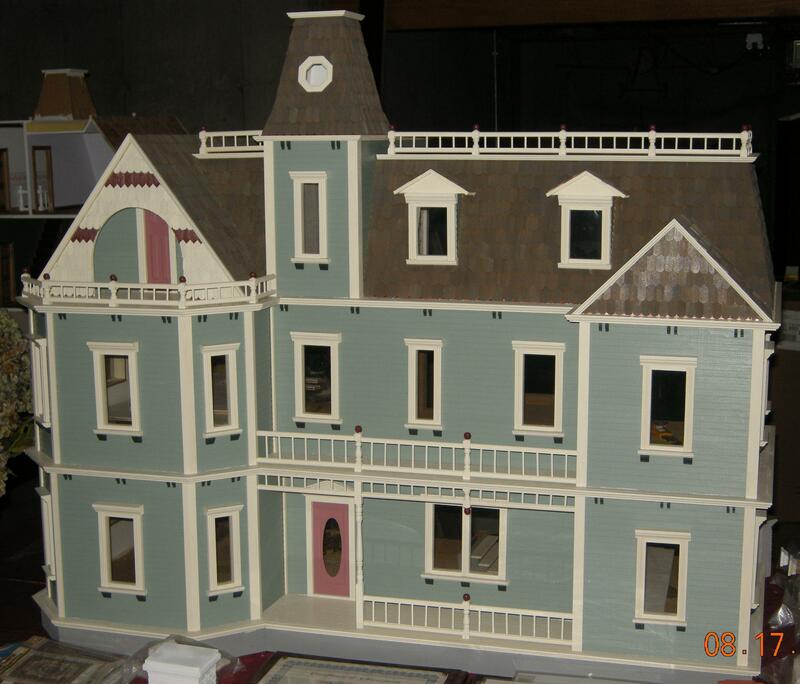 I can make a replica of a customers house, I also finish and restore dollhouses. I will email some pictures and prices and then you would need to give me a price range to work with. My cell is 203 768-3816, call me with questions. My dollhouse business is based on Trust, Honesty and Quality Workmanship. I am looking to possibly sell a custom dollhouse that is about 30 years old. It was built in Limerick, PA. I am having a hard time finding sites about buying or selling dollhouses in Pennsylvania or Delaware. Can you help me with any ideas? Thank you for checking out my web site. Please send me pictures of all four sides of the outside of your dollhouse and pictures of each room inside. Please tell me all about the dollhouse and if there are any problems. I always have customers looking for used dollhouses. Please email me at dollhousemansions@gmail.com and tell me what style, size and anything else about the dollhouse you are interested in. Did you see a dollhouse kit that you like? You could also call my cell with any questions, 203 768-3816. Where are you located? Hello-I am looking for a dollhouse of the Victorian era with 14 rooms that I can furnish. Do you add electricity, wallpaper etc? Can you give me a general price range? Yes I can build you a Victorian with 14 rooms with electrical, inlaid real wood floors, etc. My email address is dollhousemansions@gmail.com and my cell is 203 768-3816. I will send some info to your email with pictures, sizes and some prices. I’m a Master Dollhouse builder for 29 years and a retired Industrial Arts teacher for 32 years and worked for real home builders also. Hi my name is Dani and I was wondering if you would be able to create a dollhouse kit of my old house. I have photos but I can’t seem to find the blueprints of it since it was built in 1997 and the company was bought out by another. Would it be possible to create it as a kit? Please send me pictures of all four sides of the house? If you want walls and interior completed, I would need pictures of the inside also. If I understand you right, you want the house built as a flat boxed kit, so you can build it yourself? Is that right? Please let me know when you send me the pictures. I would like a house made to look just like my own house. Is that possible? Thank you for checking my work on my web site. Yes, I can build a replica of a customers house besides building dollhouse kits and custom dollhouses. I have been in business for 29 years and my company is based on three things, Trust, Honesty and Quality Workmanship. Can you send me pictures of all four sides of your house to start with. Send them to my email address dollhousemansions@gmail.com. Hello, I was wondering what the prize range would be for a large Victorian styled doll house? 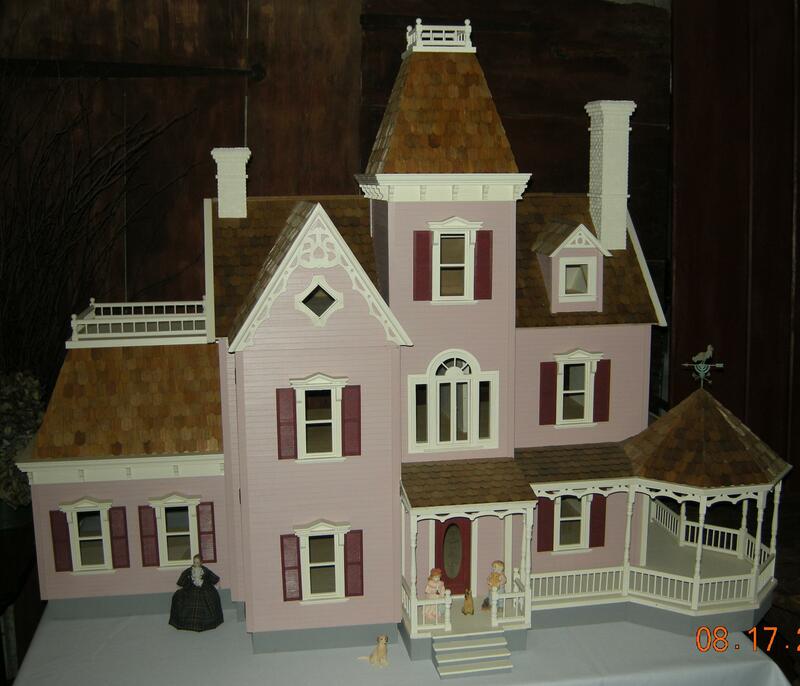 Send me an email at dollhousemansions@gmail.com and I will send you some pictures of Victorian dollhouses. Have you seen any Victorian dollhouse kits you like, if so send me the pictures? What size dollhouse would you like, how many rooms, wrap around porches etc. let me know? Yes I’m still building dollhouses for customers all over the USA. I have been building quality custom dollhouses for 29 years. Best to call my cell phone 203 768-3816 to discuss what you want built. Hi Barbara, please give me a call on my cell phone 203 768-3816 to discuss your dollhouse project. Hello I am interested in finding out how much it would be to have one of your dollhouses made, It is the yellow doll house with the girls standing next to it, I am unable to attach a picture here but I think that you know which one I’m talking about it is shown under the custom doll houses. Hi Julie, That yellow dollhouse kit is no longer available, but I have another Victorian kit that is even nicer. I will send some pictures.